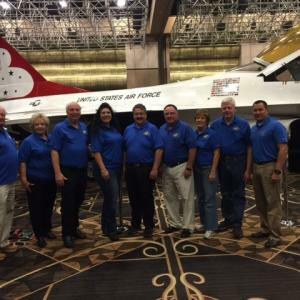 PUNTA GORDA, FLA (Jan. 21, 2016) - Members of the Florida International Air Show Board of Directors attended the ICAS (International Council of Air Shows) Conference in Las Vegas, Nevada. Pictured from left to right: Jerry Crady, Sue Crady, Dana Carr, Jennifer Smith, Tyler Ezzi, Mike Dallenbach, Pam Brown, Sam Sanders, and Ray Laroche. Board members that were unable to attend include Bucky McQueen and Ricki Markle. New Board Members Dana Carr and Jennifer Smith attended the comprehensive three day training program consisting of Air Shows 101: Air/Ground Operations Training Seminar and Air Shows 102: Air Show Business Basic. The next Air Show is scheduled for October 21-23, 2016 at the Punta Gorda Airport (KPGD). “This is a new chapter for the Florida International Air Show. While standing on the shoulders of 35 years of Air Show success, the overwhelming community support to bring back the Florida International Air Show is greatly appreciated.” – Tyler Ezzi, Air Show Chairman. Friends of the Air Show and sponsorship opportunities are now available. Visit the Florida International Air Show Facebook page and website www.floridaairshow.com for further information on this event including acts and show details.